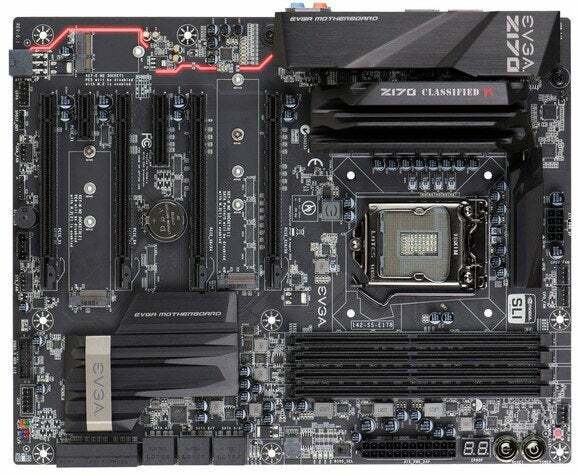 EVGA recently introduced a BIOS update for Z170 motherboards that allows for overclocking of non-K series Skylake chips. Another motherboard maker just joined the overclocking revolution for cheaper, non-K series Intel Skylake chips, following in the footsteps of ASRock, Biostar, and others. Perhaps less-than-coincidentally, EVGA also announced its new $290 Z170-K Classified motherboard today, featuring 3600MHz+ memory support, USB 3.1 support, and a Killer E2400 NIC. The story behind the story: Facilitating overclocking—the ability to run your processor’s clock speed faster than it’s rated to—of lower-class Skylake chips is something of a trend in recent months, but don’t expect every motherboard maker to join the non-K OC bandwagon. We’ve been hearing that some hardware companies have no intention of allowing for non-K Skylake overclocking due to long-term technical compatibility concerns and other issues. Intel never meant for its non-K Skylake chips to push past their clock speed limits, but anytime Intel limits its chips, like that there always seems to be a workaround. The issue is whether Intel will try to put a stop to it. If you ask me that sounds like, “we don’t want you to do it, but if you do you’re on your own.” For seasoned overclockers, though, that’s familiar territory. But Intel could get a little more aggressive if the overclocking trend starts pulling too many customers away from its more lucrative K-series chips. For now, however, the good times can keep on rolling just a little bit faster—depending on your motherboard. Gordon Ung and Brad Chacos provided additional reporting for this article.